Éder's superb late goal sent Italy through to the Round of 16 after a somewhat uninspired performance from Antonio Conte's side at the Stadium Municipal. The Italians were held scoreless up to the very late stages of the game, with Sweden's performance just falling short of any goal threats. But when Chiellini's throw-in was knocked on towards compatriot Éder, a run along the outside of the box perimeter evaded defenders before a neat finish into the bottom corner booked their spot in the knockouts. Italy's defence had their hands full with the assignment of Zlatan Ibrahimović proving an tough one for any in the continent. They made a small victory early on though, with Chiellini beating the forward to the ball after a cross was whipped in by Källström on the left flank. His nation started the more impressively, although the Azzurri would grow into the game. Isaksson was grateful to clutch on to the ball that initially came from Florenzi's strike, taking a deflection and rolling towards him, before Zlatan went down in the box at the other end, although play was off before that for a foul by Guidetti on Barzagli. Both teams were pushing forward but as has been the case with many opening stages of the Euro 2016 fixtures, the quality didn't follow suit, with only one shot towards goal after half-an-hour. That goal would not be threatened by Guidetti either, who smashed it well off target after good play by Zlatan picked out Larsson. With the first half winding down, they controlled possession and on another day could easily have had a penalty after their talisman was felled by Chiellini when trying to head Källström's cross. Sweden knew they needed something from the game after a drab 45 minutes. But Italy, with little impetus to win the contest, did do well to set up Pellè although his volley would fizz off target. A few players were suffering some knocks though with heavy challenges, as Giaccherini was clattered into while Ibrahimović knocked into Éder. Up until the final third, Sweden were indeed excellent. They moved the ball around and dictated possession, but at the business end they could do little. Even though it was ruled offside, Zlatan highlighted this struggle, blasting over the crossbar from 3 yards. With the full-time whistle quickly approaching, Sweden were beginning to settle at the prospect of a draw, although late at the death Éder would break their hearts. It was a spectacular goal too which was only fitting of breaking the deadlock. A throw-in was headed on to him on the left, where he ran parallel to the box, evading numerous defenders as they tried to contain him, before unleashing a low, powerful strike to the far right corner and putting Italy through. They could have ran away with it when, just a minute later, Candreva forced a stop from the keeper after he found space in the box from the right. 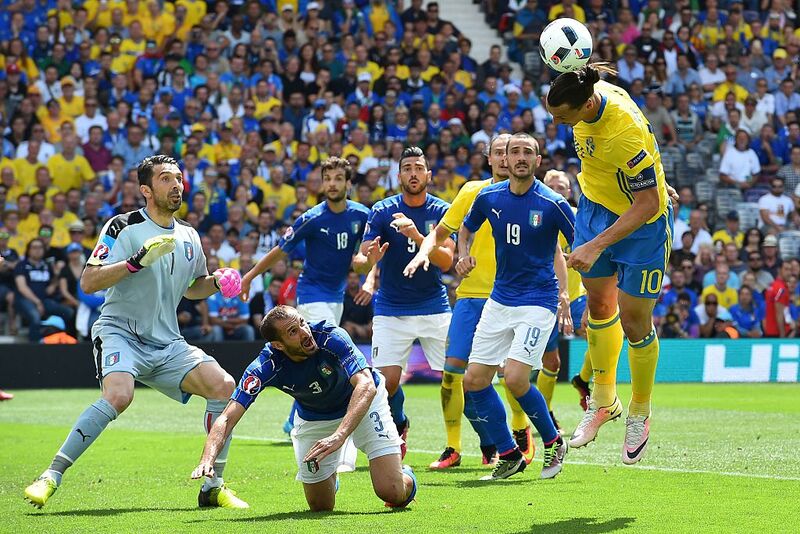 The Azzurri were keen to run down the clock in stoppage time, with Buffon receiving a booking for time wasting. Huge penalty appeals late on were waved off by the referee as Italy just about managed to get rid of the threat inside the area, keeping a clean sheet to start off the tournament with 2 straight victories. It was another Italian Job.